Last time, I noted that the white working class in the UK are about 37-46 percentage points more likely to want immigration reduced than young graduates. Here I compare the immigration attitudes of the white working class (defined the same way as before) to those of "Labour elites"––individuals with a university degree who support the Labour Party. Data are again from the 2013 wave of the British Social Attitudes survey. The first chart plots the distributions of responses to the question, "Do you think the number of migrants to Britain nowadays should change?" The second chart plots the distributions of responses to the question, "Would you say it is generally bad or good for Britain's economy that migrants come to Britain from other countries?" 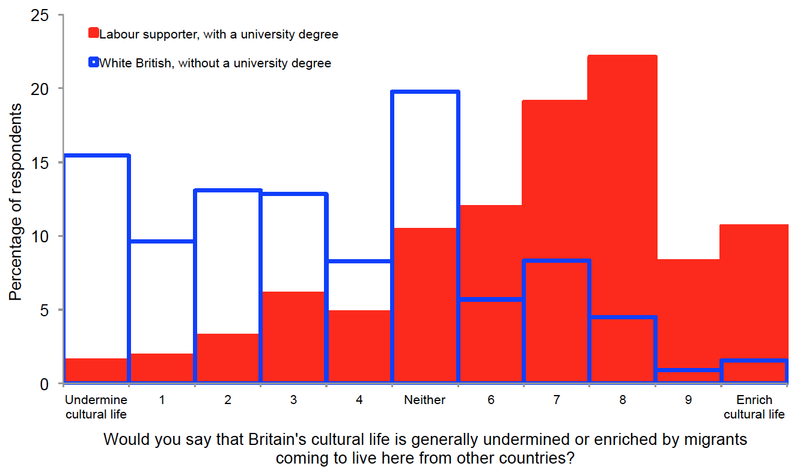 And the third chart plots the distributions of responses to the question, "Would you say that Britain's cultural life is generally undermined or enriched by migrants coming to live here from other countries?" Perhaps unsurprisingly, in all three cases there is a vast difference in attitudes between the white working class and Labour elites; the former have a substantially less favourable view of the economic and cultural effects of immigration than the latter. As I've noted before, a large majority of the British public is in favour of reducing immigration: around 70-80%, depending on exactly how the question is phrased. Here I compare the immigration attitudes of two salient social groups: young graduates––individuals aged 18-35 with a university degree; and the white working class––individuals with two British-born parents who identify as white and do not have a university degree. Young graduates are of interest because they comprise a disproportionate share of the social media commentariat––those who share articles and broadcast their opinions on Twitter and Facebook. The white working class are of interest because they are the demographic which has allegedly been abandoned by the Labour Party, their traditional and natural ally. Data are from the 2013 wave of the British Social Attitudes survey. 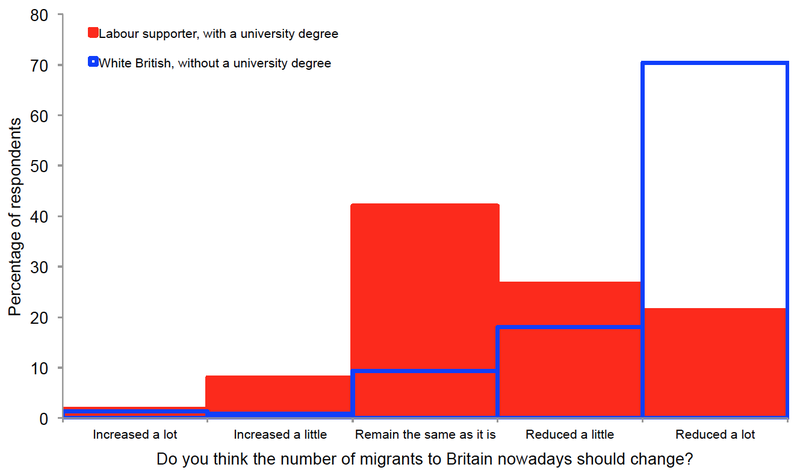 Respondents were asked, "Do you think the number of immigrants to Britain nowadays should change?" The response categories were "increased a lot", "increased a little", "remain the same", "reduced a little", "reduced a lot" and "don't know". The two charts below display, respectively, the percentages of young graduates, the general population and the white working class who want immigration "reduced a little" or "reduced a lot"; and the percentages who want immigration "reduced a lot". Unsurprisingly, the gap between young graduates and the white working class is huge: 37 percentage points in the top chart, and 46 percentage points in the bottom chart. Indeed, these are larger than the gaps between Labour and Tory voters on state ownership of rail and energy companies. Nearly 90% of the white working class want immigration reduced, compared to only 50% of young graduates. And 70% of the white working class want immigration reduced a lot, compared to under 25% of young graduates. Is wealth inequality high in Denmark and Sweden? 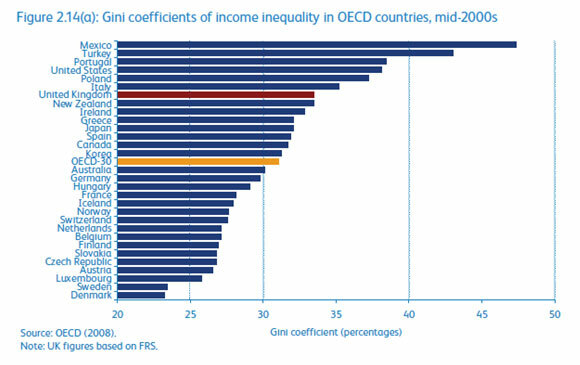 It is well known that the Scandinavian countries have some of the lowest levels of income inequality in the world. According to several recent studies, however, Sweden and Denmark appear to have some the highest levels of wealth inequality. Sierminska et al. (2008) examined data on seven countries from the Luxembourg Wealth Study. They found that wealth inequality was highest in the US and Sweden. Davies et al. (2009) examined Household Balance Sheet data on twenty countries. They found that wealth inequality was highest in Denmark, Switzerland and the US, with Sweden in sixth place behind Indonesia and France. Skopek et al. (2014) examined data on eighteen countries from both the Survey of Health, Ageing and Retirement in Europe and the Global Wealth Databooks. They found that in the SHARE data, wealth inequality was highest in Estonia, Switzerland and Israel (with Sweden in sixth place and Denmark in ninth); but that in the GWD data, wealth inequality was highest in Denmark, Switzerland and Sweden. Most surprising is certainly the finding that the Northern European countries––known for their high level of social equality––exhibit high levels of wealth inequality, although a number of studies have already reported this phenomenon, most of them for Sweden... and also several for Denmark. I'm not quite sure what to make of these findings yet. One alarm bell is that average wealth appears to differ vastly more across developed countries than either average household income or GDP per capita. For example, according to the SHARE data analysed by Skopek et al., median net worth is €180,820 in Belgium, but only €83,700 in Austria––and this is despite the fact that GDP per capita is slightly higher in Austria. I just came across a fascinating article by John Pfaff entitled 'The War on Drugs and Prison Growth: Limited Importance, Limited Legislative Options', which was published in the Harvard Journal on Legislation. The central thrust of the article is that, contrary to widespread belief, the rise in incarceration has not been primarily driven by "increases in the arrest, conviction and incarceration... of low-level drug offenders as part of federal, state, and local efforts to combat drug use and trafficking". If we were to release every inmate serving time for a drug offence in 2010, the total prison population would fall from 1,362,028 to 1,125,028, and... the percent of the prison population that is black would fall by only 1.4 percentage points (from 38.1% to 36.7%), and the white-black gap would narrow only slightly, from 3.8 percentage points (34.3% vs. 38.1%) to 1.2 percentage points (35.5% vs. 36.7%). Incidentally, this is not to say the War on Drugs hasn't contributed to the rise in incarceration by changing the incentives for individuals to engage in violent behaviour, namely making it profitable to shoot rival gang members, the better to protect one's monopoly in the local drug market. "Open borders?... That's a right-wing proposal, which essentially says there is no United States... You're doing away with the concept of a nation state, and I don't think any country in the world believes that." "If we're gonna have a country, we need a border... You don't have a country without a border. You know, what's a country? How do you define a country if you don't have borders?"